Three-star linebacker Dillan Lawson (Crestview, FL) and the Florida Gators parted ways on Wednesday evening in a move that was initially seen as a decommitment but is actually a mutual decision between the parties. Lawson, who was one of six players to commit to Florida at the team’s Junior Day on Feb. 18, was relatively unknown in recruiting circles at the time of his pledge. At 6’4” and 215 lbs., he also claimed offers from Florida State, Louisville and North Carolina and began being noticed more following his commitment. Lawson told ESPN ($), which first reported the change in his commitment status, that Florida did not withdraw his scholarship though he hinted to the situation being murky, which is why he has opened his recruitment. “I’d love to go to Florida, don’t get me wrong. I’d still love to go to Florida,” Lawson said. 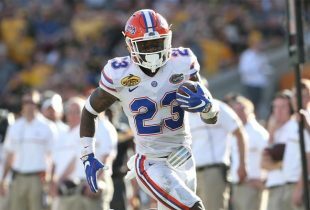 His Crestview High School coach, Kevin Pettis, told The Gainesville Sun that the decision was mutual but that the Gators would offer Lawson again once his academics improved. “He’s back at Crestview now and doing all the things academically that he’s supposed to be doing. But we’re still trying to make up core classes to boast his GPA and ACT,” Pettis told the paper. “This didn’t happen because he’s not interested in Florida. Coach [Will] Muschamp and the staff did a great job with him. I just think Dillan realized he needed to look at some other places, and I told him if you’re going to do that you have to decommit so that Florida can go out there and recruit another player. Lawson is waiting to hear back from Florida linebackers coach D.J. Durkin before deciding whether or not to attend Friday Night Lights in late July, according to ITG. He is unranked by Rivals but a four-star prospect and 285th overall player per ESPN.